Let us provide the complete window… stained glass, aluminum frames, and protective storm covering. 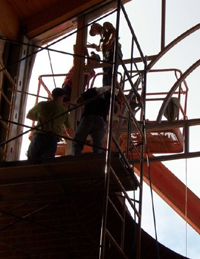 Our aluminum frames system is custom designed and fabricated in-house. 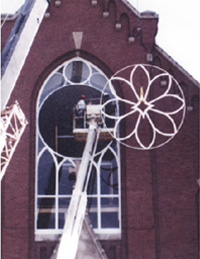 We have 2 frame systems specifically designed for use with stained glass. 4-inch Double Glaze System: Accommodates stained glass and 1/4-inch thick clear protective storm glass. 5-inch Triple Glaze System: Accommodates stained glass and 1-inch thick energy efficient insulated glass. 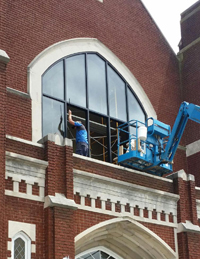 Both systems are fabricated using heavy gauge aluminum frame material with snap-in aluminum stops for securing the stained glass and protection glass. Frames are available in stock colors of white and dark bronze. Custom colors are also available for a small additional charge. Single sourcing stained glass, protection glass and frames ensures a smooth installation and reduces lead-time typically associated with other frame systems.